(CNN) -- England bowlers Graham Onions and Graeme Swann scythed through the West Indies' batting as the tourists lost seven wickets for 29 runs in a paltry 152 all out at Lord's on Thursday. Onions takes the congratulations of the crowd after his five-wicket Test debut haul. The tourists ended day two of the first Test on 39 for two, after being forced to follow on, still 186 runs behind England's total of 377. Off-spinner Swann (three for 16) began the collapse with two wickets in two balls -- to add to his maiden 50 in England's innings -- while debutant seamer Onions (five for 38) then took four wickets in seven balls. The blur of departing batsmen began when Swann saw off opener Devon Smith and then Shivnarine Chanderpaul for a golden duck just before tea. Then Onions grabbed his slice of the action as the Windies capitulated in an innings which lasted just 32.3 overs and contained the loss of four wickets for two runs at one stage. 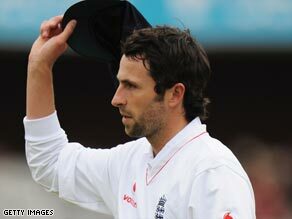 Earlier, Swann had finished unbeaten on 63 before England were eventually bowled out in early afternoon. The all-rounder's eighth-wicket stand of 93 with Ravi Bopara (143) was followed by two more successes for Windies paceman Fidel Edwards (six for 92), who completed his best-ever figures against England.